Mon coeur est avec Paris, translation: my heart is with Paris. 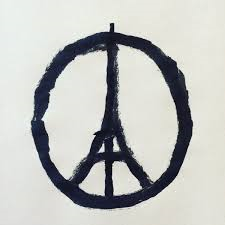 Like many people I was glued to my phone to get any and all information I could about what was happening in Paris. Cowards decided to enter a place of entertainment, fun, and peace and shatter a night that was meat to be a great one. Almost 24 hours later I sit here trying to wrap my tiny Canadian mind around what happened. I’ve come to the conclusion that there is nothing to wrap my head around. Bad people who feel that the French government was at war with them took their revenge on the population. They choose their targets and acted in a horribly brutal fashion. I was watching a Periscope broadcast earlier when one user said that they had heard that the attackers where using crowd control methods to ensure there were no heroes, they systematically killed many people some one-by-one. I couldn’t imagine being in that theater…watching what had happened fearing you might not make it out alive. The title of this entry seemed so fitting and came from the most unlikely of places. Although I wanted to obsess over what was going on in Paris I didn’t want to engross my mom in that violence so I decided to watch a movie. I chose the 2015 version of Cinderella (http://www.imdb.com/title/tt1661199/?ref_=nv_sr_1) and one of the most powerful lines in the movie and a consistent thread presented throughout the movie is to “have courage and be kind”. I thought that line was very apt for what was happening in Paris. I’m an ordinary Canadian who sat in shock watching what was happening. I don’t have any answers, and at this point I don’t have any questions. I’ve seen a lot of reactions to this tragedy, hate, ignorance, but the one I will align myself to is love. We cannot fight darkness with darkness we have to have light, we need to realize that we are all humans, we bleed when damaged and our hearts break with great suffering. We seem to continue to want to damage ourselves we are our own worst enemy. I’ve been lucky that all of my loved ones and friends all are on the same page. However to those who might read this and think differently; I forgive you. I understand fear, hatred, ignorance, I understand the need to wrap your brain around such events and take the easy way out. We cannot blame one whole group of people, who like you love, work, and try to get by. We cannot condemn one religion because we may not understand it, we cannot blame anyone than the ones truly responsible. I’m not religious and I don’t hide the fact that I’m agnostic, so I will not pray for Paris. But I will do what I can to continue to live my life; not taking anything for granted, I will continue to be courageous and be kind.